Your driveway, patio and walkway is the portal to your home. It’s the first thing that guests see when they visit. The rule that you have 7 seconds to make a first impression applies to your home as well. What kind of impression is your front entryway making? 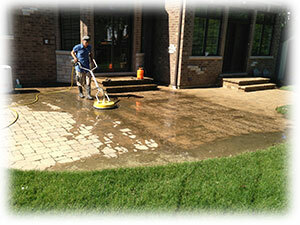 If the concrete pathways around your home are dirty or stained our seasoned driveway pressure washing and patio power washing professionals will leave your concrete looking as good as new. We primarily service the northern suburbs including the towns of Glenview, Northbrook, Highland Park, Glencoe, Lake Forest, Arlington Heights and Winnetka. Our highly trained, uniformed employees have a vast knowledge of the soaps, detergents and algaecides required to remove common problems such as dirt, oil stains, algae, moss and tire marks as well as less common issues such as discoloration from rust, tannin or acid. We don’t just use some simple power washer from home depot, our teams are equipped with a heavy duty commercial hot water pressure washer. The ability to produce high volumes of hot water is really what gives us that big cleaning advantage. High temperature cleaning is necessary for the effective removal of a variety of substances without having to resort to harsh chemicals. All of our cleaning soaps and detergents are biodegradeable. Couple that with our professional grade surface cleaner’s which are specially designed for the task of cleaning flat surfaces, they are much more effective than just a wand alone and provide a smooth, even clean – no wand marks or uneven tiger stripping. Whether you’re preparing to sell your home, deep cleaning for a special event, or just getting ready for spring, Let the professionals at Northern do the hard work, all you have to do is sit back and enjoy your professionally cleaned property. 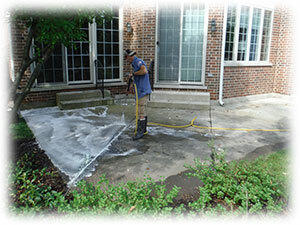 Call us today and let our highly trained professionals leave your driveway, sidewalks and patios looking like new.